You may be looking for Perennial Onion Cultural Notes for information on potato and multiplier onions and shallots. How to Grow: Onions often only have a short window of time to grow before heat and/or lengthening days cause bulbs to stop growing and start drying down. To encourage fast growth, plant large, healthy seedlings into fertile, weed-free soil as early as soil can be worked. Onions require light, fertile, well-drained soil with lots of organic matter. Maintain soil pH 6-7. Soil that is too acid or alkaline will cause slow growth and late maturity. 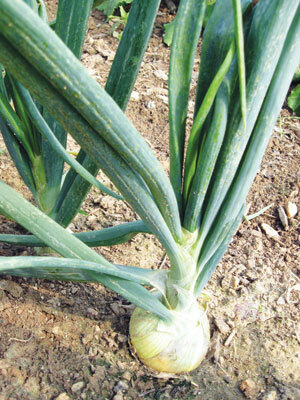 Onions are heavy feeders requiring abundant potassium and phosphorous for good bulb formation. Nitrogen should be abundant during the period of active leaf growth. Onions and weeds do not mix. Experiments have shown yield reductions of 4% per day in the presence of weeds, or 50% reduction of yield in 2 weeks. Cultivation should be shallow since onion roots are near the soil surface. A layer of organic mulch will help suppress weeds and will aid in maintaining moisture and nutrient levels. Transplanting: Sow seeds indoors or in the greenhouse, 1/4 in. deep, any time from mid-September through mid-March. Earlier sowing means larger bulbs because plants will get larger before heat and/ or lengthening days signal them to bulb up. Transplant outdoors 3-4 in. apart in rows 12-16 in. apart in February or as early as the soil can be worked. Do not prune the tops, or the harvest will be significantly decreased. Onion seedlings are hardy to about 20 degrees F.
Harvest: When most of the tops have fallen over, pull onions, cure in partial shade for 2-3 weeks until necks have thoroughly dried. Clip tops to within 1" of the bulb. Breaking over the tops by hand to accelerate harvest harms the keeping quality of some varieties and helps the keeping quality of other varieties. Pests and Diseases: Practice crop rotation of at least 3 years to control pests and diseases. Compost all onion residues. Long Day (LD) and Short Day (SD) Types: Varieties are designated as LD or SD. LD types begin to form bulbs when day length is 14-16 hours. Plant LD types in spring from Virginia northward. Not all LD types can bulb up as far South as Virginia, but ours can. SD types begin to form bulbs when day length is 10-12 hours. SD types can be spring or fall-planted in Virginia, and fall-planted in the South. If started in a greenhouse, or started in the fall and kept refrigerated as sets, SD onions can be grown to small bulbs in the North. Seed Savers: Isolate varieties by a minimum of 150'. For pure seed, cage plants or isolate by 1/4 to 1/2 mile. Bunching onions are perennial onions which divide at ground level in the same manner as multiplier onions. Unlike potato onions they do not form large bulbs. The bases of bunching onions are slightly enlarged, like scallions. Once established, clumps need only be divided periodically. How to Grow: See Cultural Notes for bulb onions from seed. For easiest weeding, space clumps of 10 seeds 6-12" apart. Bunching onions are cold-hardy and may be left in the ground year-round where the ground doesn't freeze. Where the ground does freeze, most varieties should be transplanted into a greenhouse or cold frame and moved out again in the spring. Packet: 1g (about 450 seeds) sows 25'. Preventative Medicinal Effects: Onions are a rich source of quercetin, a natural substance which suppresses the proliferation of some types of malignant cells. Red and yellow varieties may contain up to 10% of their dry weight as quercetin and enthusiastic onion eaters have a lower rate for certain types of cancers. White varieties contain little or no quercetin.